Marcus asks: Why do songs get stuck in your head? Whether yours is “Call Me Maybe,” “Who Let the Dogs Out,” “Mickey,” or something equally infectious, at one time or another, you’ve probably had a fragment from a catchy (or obnoxious) tune stuck in your head. Where Do Sticky Songs Come From? Due to the involuntary nature of songs getting stuck in people’s heads, it is notoriously difficult to study. As such, the exact mechanism in the brain that causes this phenomenon isn’t yet fully understood. At a higher level, some scientists see humanity’s ancient practice of passing down knowledge through song as a possible source for this tendency. For most of the 200,000 years of modern human evolution, facts, history, processes and other information were transmitted and remembered through spoken and sung words. This has led some scientists to opine that the human brain has become hard-wired to encode spoken and sung information, and recall it upon demand. Consider that, even today, many find it easier to memorize something to which a rhyme or rhythm has been added. From here, our brains seem hard-wired to finish what they start with the portions of the songs. In fact, when researchers at Dartmouth played small snippets of familiar songs to research subjects, they found that the auditory cortex of the brain continued the song in the subjects’ heads even after the music stopped. It’s perhaps not surprising from this that the more you listen to a song, the more likely it is that at some point it will stick in your brain. Further, people with Obsessive Compulsive Disorder have been shown to be more prone to getting songs stuck in their heads. That said, according to the Proceedings of the 10th International Conference on Music Perception and Cognition, over 90% of us get a sticky song (also known as an “earworm”) at least once a week. It is further estimated that approximately 98% of humans experience sticky songs at some point or another. 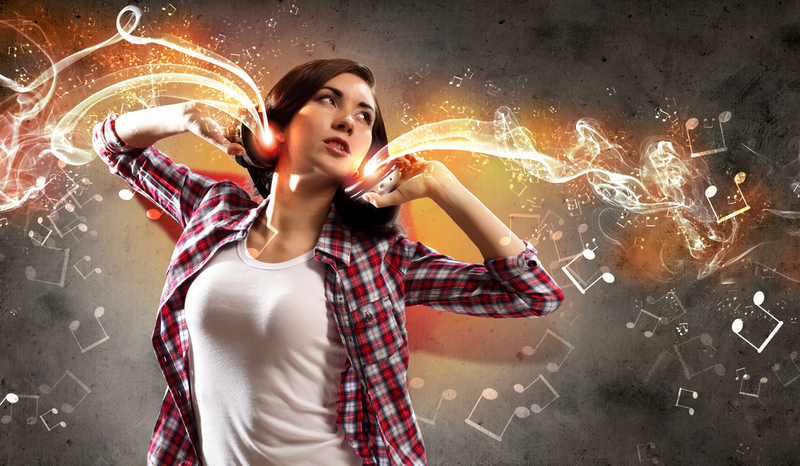 Scientists have identified two main sparks that are commonly found to trigger an earworm. As mentioned, exposure is perhaps the most common reason a song fragment lodges in your noggin. This includes both how recently you’ve heard a song and how often it was repeated. Given that the vast majority of the time we listen to music, we’re listening to something we’ve already heard before, the odds of getting an earworm are pretty good. Two recent examples of overplayed, popular tunes that can easily get stuck in your head are Robin Thicke’s “Blurred Lines” and “Let It Go” from Frozen. Sometimes an aspect of your environment will trigger an earworm, including words, persons, rhythms, situations and sounds. For instance, while doing household chores, songs like Rose Royce’s “Car Wash,” Don Henley’s “Dirty Laundry,” and Fishbone’s “Housework” may play inside your head. Likewise, more indirect associations may develop, such as something going on around you when you hear a song causing your brain to associate the song with otherwise unrelated external factors. Later, when you’re in that same environment, your brain may dredge up the song and repeat the most memorable part of it over and over again in your mind. There are certain characteristics, of both songs and people, that make catching a sticky song in your head much more likely. Tend to have notes with longer durations but smaller pitch intervals . . . [which are also the] two main features that make songs easier to sing, even for the musically untrained. . . . . Fundamentally, an earworm is your brain singing. . . . In at least one study, a strong connection was found between those people who “placed a high degree of importance on music,” and the frequency, duration and irritation caused by an earworm. This may lend itself to the “overplayed” trigger, with music lovers simply listening to music more often than most. As mentioned, people who tend to be more obsessive (but not clinically neurotic) are more likely to have earworms. They also often report feeling like they have less control over the phenomenon. Additionally, studies have shown that in some individuals certain medication used to treat OCD can reduce the frequency of a song getting stuck in one’s head. There are several tricks you can try to help drive sticky songs away. One expert recommends “using your words” to kill an earworm. She notes that simply by speaking with someone else, or thinking through the words of a crossword puzzle, the lyrics of the song will be supplanted with new lexemes. If all else fails, you might have to try wearing the beast out by listening to the full song, rather than just the repetitive snippet running through your head. The sticky song phenomenon is global, and in France, it is sometimes called musique entêtante (stubborn music), in Italy, canzone tormentone (tormenting songs) and in Germany, Ohrwurm. Earworms pre-date modern recording equipment. In fact, among other famous historic individuals who’ve mentioned it, Mark Twain published a story in 1876 about “a damningly catchy jingle that gets stuck on mental repeat,” one year before Thomas Edison invented his phonograph. Have a Song Stuck in Your Head? Here’s How to Get Rid of It. In Oliver Sacks’ Musicophilia he writes about these intrusive tunes and recounts a story about a friend of his who spent 10 days incessantly hearing the Married .. With Children theme song playing in his head. How it interfered with his work, sleep and peace of mind and only on its own did it fade away. It seems this phenomenon must be more neurological than it is emotional. Either way I curse this article for even mentioning that dam Carly Rae Jepsen infection! This is an interesting phenomenon, but one can learn to completely control it. I write music, so I ALWAYS have music playing in my head, even if subconsciously – right now it’s Goodbye Pork Pie Hat by Jeff Beck – and I can switch to something else whenever I want. OK, I decided on Room 335 by Larry Carlton. Neither of those has lyrics, BTW, and I can concentrate on the guitar, harmony, or bass line, so I don’t think language really has much to do with it. What humans are wired for is music. Beethoven used this inner-ear to compose once he lost his hearing, BTW. I once had Handel’s “Water Music” stuck in my head for a solid month. I love Handel, so it wasn’t terribly burdensome. On the other hand, I have to put my hands over my ears and yell “blah, blah, blah” if I hear anything by Abba. My cure is simple. I start thinking about another song, usually “Eight Days a Week” by the Beatles or “Razor Boy” by Steely Dan. No idea why those work without turning into earworms themselves. I’ve got All About That Bass by Meghan Trainor stuck in my head, thanks to that annoying commercial for the Honest Company with all the babies in it. With Prince’s sudden death we’ve been inundated with his music. Lately I can’t shake When Doves Cry. But a few other times lately there have been other songs. I think a good dose of stress makes me more susceptible.